Of all the family stories, the one most fascinating* to me is that of my great-grandpa. My mom can tell this story better than I, but it involves the Great Depression, hitching rides on trains from West Virginia out to the promise of the West, singing gospel songs on the radio along the way, and eventually, happenstance-ly, meeting the brother of the woman who would eventually become my great-grandma. Maybe we can get Mom to tell the story in its entirety. 1) Whenever my mom and I visited, he would have fresh, summer-ripe peaches for me to eat, but insisted that they be peeled by dropping them in a pot of boiling water to slip the skin off. This, of course, took time – time for the pot of water to boil, time to allow the peaches to cool before slurping them up, and time wasted (in my 3- or 4-year-old mind, at least) that could have been spent slurping up more peaches. Sometimes, though, a memory wants to be more than just remembered – it wants to be recreated, tried again, honored, even. 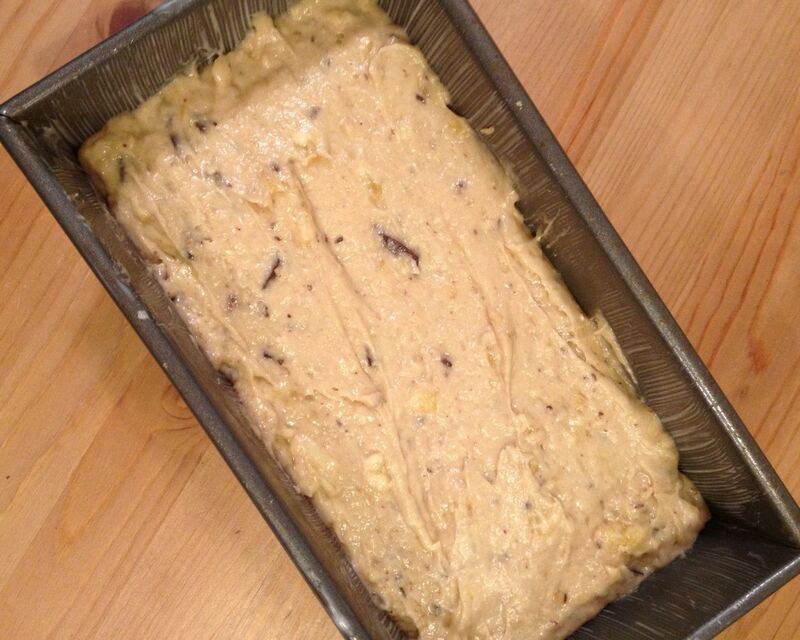 With a description like that, how could I not try to make banana bread that even my 3- or 4-year-old self would love? …except when I started to mix the ingredients together, I came to a realization that, hopefully, a 3 or 4 year old wouldn’t come to: What goes quite, quite well with brown sugar, ripe bananas, vanilla, and chocolate? Rum – just a dash – a taste – a hint – of rum. 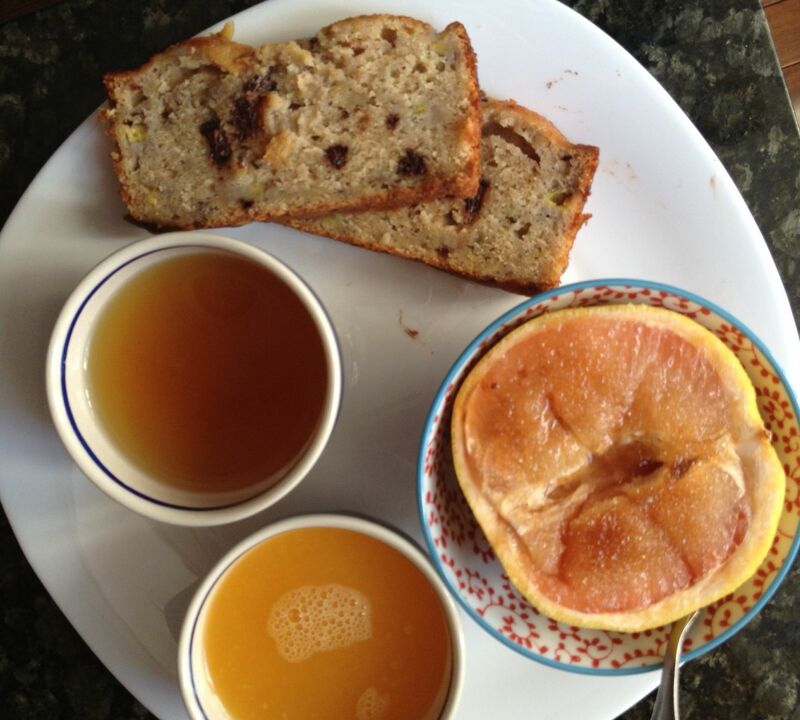 The bread/cake comes from Nigel Slater, and it is absolutely a-ma-zing. Don’t wait 20-something years to make this banana bread, ok? A note about measurements: In my “I just graduated from college! I need to have a decently stocked kitchen! I need a digital scale!” phase, I purchased a digital scale. I believe it was this one. It’s super convenient and accurate and has all those nifty weight options. What I’m saying is, I left the below measurements in grams. Sorry if that makes this recipe difficult to convert, but maybe this is life’s hint that it’s time for you start your “I found a delicious-sounding recipe! I need a digital scale!” phase. 1. Preheat your oven to 350 F. Line a standard-sized loaf pan with parchment paper, or grease/butter a loaf pan if you recently ran out of parchment paper. 2. In a large bowl, cream the butter and sugar together. Add the eggs and beat until combined and slightly fluffy. 3. Peel the bananas and mash them with a fork in a medium bowl. You want the bananas to be a little lumpy and not completely pureed. 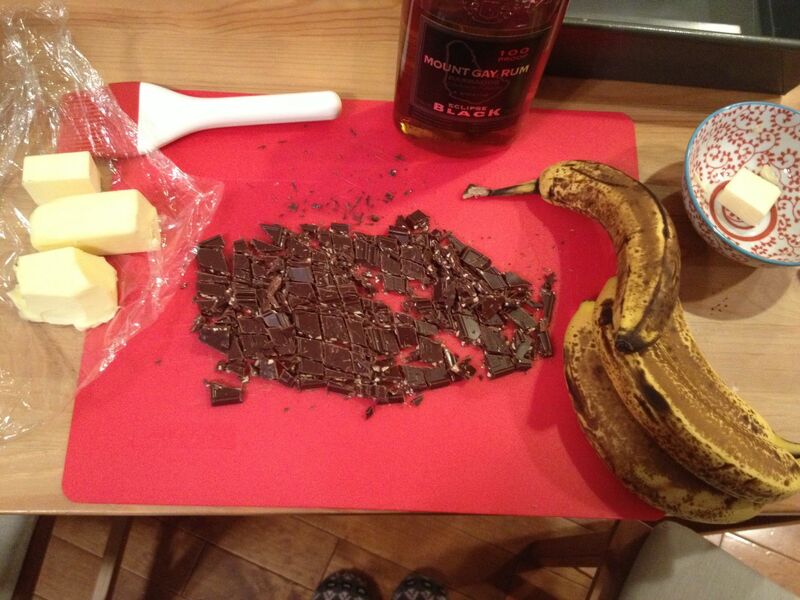 Stir the vanilla extract and rum into the bananas. 4. Fold the chocolate and mashed banana mixture into the butter/sugar/egg bowl. 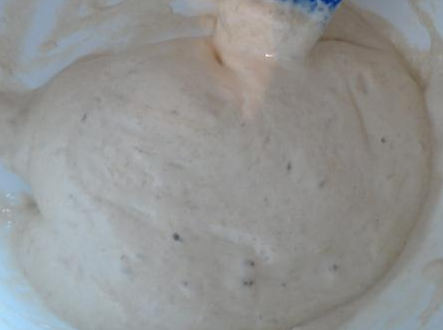 Gently mix the flour and baking powder into the banana batter. 5. 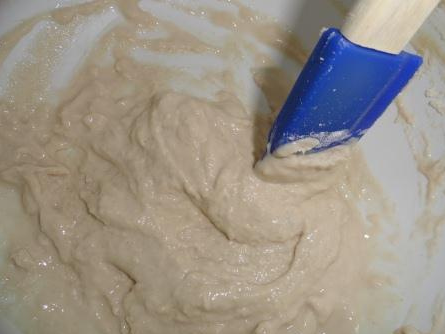 Scrape the batter into the loaf pan and bake in the oven for 50 – 55 minutes, rotating the pan halfway through, until the bread is browned and a skewer inserted into the center comes out clean. 6. Remove the bread from the oven and let sit on a rack for 15 minutes, then gently plop the bread out of the pan and allow to cool completely on the rack. Luisa says the bread will keep for a week or more – we’re on day three and it’s more than halfway gone, so I doubt we will have the chance to test its longevity. Also, this bread is quite good toasted, with a pad of butter. Or, nutella. Surprised? In other news, I have about five (5!!!) other recipes I neeeeeed to tell you all about. Omg, you guys, they’re great. *Ok there is actually another story about a different great (or maybe great great) grandpa who may or may not have been a dear, close friend of Pancho Villa and fled Mexico after that all went down, but that story is more family legend than fact. Maybe. When I was growing up, Sunday afternoons had a predictable routine: we all piled in the car and went to visit my dad’s parents who lived about an hour away. Some of the aunts and uncles and 41 cousins on that side of the family would invariably be there, which meant lots of fun as well as plenty of food. Whenever I think of Grandpa I remember his garden and how proud he was of his bountiful harvests of tomatoes, chiles, tomatillos, and melons, all started from seed. Dad and the uncles were farmers, so there were always burlap sacks full of potatoes, onions, and beans in the storeroom. Although she made it seem effortless, Grandma always had food ready for all of us: I remember many meals of carnitas, tamales, or chicken with mole and sopa de arroz, and with every meal there would always be frijoles and tortillas. Grandma turned out tortillas faster than anyone I have ever known. Coming from north central Mexico, she favored flour tortillas to use as a daily bread and reserved corn tortillas for enchiladas and tacos. I can still picture her there in her little kitchen, balls of masa (dough) ready to roll. Her rolling pin was basically a chunk of thick wood dowel, about ten inches long and not quite two inches in diameter, with no handles. No matter how many of us showed up, there was always a never-ending stack of tortillas, and to this day, I love to eat beans by scooping them up with pieces torn from a fresh soft flour tortilla. I’ll probably post a recipe for tortillas someday, but that’s not where I’m going now. I mentioned the book Like Water for Chocolate in my recipe for frijoles, and there is one line in particular from the book that my Grandma truly exemplified: “… with a little imagination and a full heart one can always prepare a decent meal.” Molletes are a great example of that approach to food – they are simple, filling, delicious, nutritious, and versatile, perfect as a quick breakfast or an after-school snack (and they also make a good inexpensive customize-your-own party food). 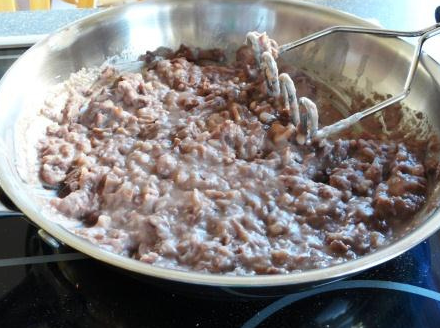 First, the Refried Beans – the English translation of frijoles refritos notwithstanding, the beans aren’t really fried twice. The “re-” prefix in Spanish corresponds to the adverb “well,” and “refritos” means well-cooked (just as chiles or churros rellenos are well-filled chiles or churros – “lleno” means “full”….but I’d better cut the Spanish lesson short before I develop a craving and find myself in the kitchen frying churros). 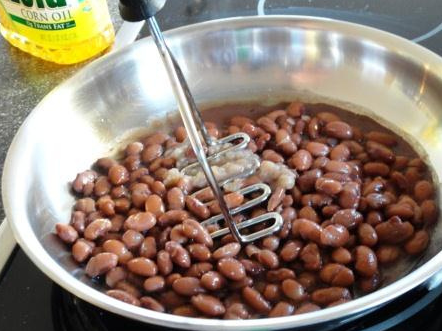 To make frijoles refritos you simply take tender-cooked beans and heat them in a little oil, mashing them up with a potato masher or fork and mixing in a little of the bean broth to get the consistency you like. If you want some extra spice, you can heat a dried chile de árbol in the oil until it is soft, then remove it before adding the beans. Or you can use a powdered spice blend such as Don Enrique’s Pico de Gallo (my husband’s favorite seasoning that he puts on almost everything). I cook my beans with a clove of garlic, chunks of onion, and a couple of jalapeños. By the time the beans are done, the onions and chiles are very soft, and I usually mash them up with the beans when I make frijoles refritos. Homemade frijoles refritos are super-economical and tasty, but I always keep a can of refried beans in the pantry for those times when I haven’t planned ahead, and they work just fine for molletes. If you are using canned refried beans, warm them up in the microwave or on the stove, mixing in a little hot water (and a dash of Pico de Gallo or other chili powder), and your molletes will still be delicious. Molletes are traditionally made with a Mexican roll called a telera, or the telera’s cousin, the bolillo (AKA francesito or little French bread – a lasting effect on Mexican cuisine from the 1860s French Intervention). Any sturdy bread will work for molletes, and in the photo you’ll see I’m using brown-n-serve baguette-brötchen (so I guess this is a fusion version of molletes…especially since my cheese is a Russian tvorog, which is the closest thing I’ve found in Germany to Mexican queso fresco). Split the rolls in half and spread each side generously with warm refried beans. Sprinkle with shredded or crumbled cheese (whatever kind you like) and heat under the broiler or in the toaster oven until the beans are hot and the cheese is starting to melt. 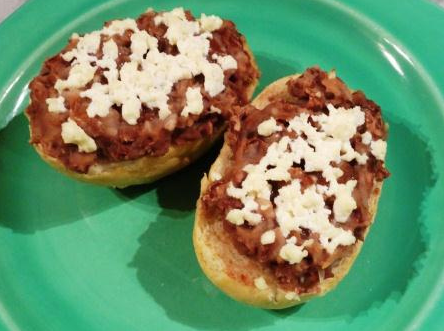 As I mentioned, these molletes are great if you want to entertain on a budget (seriously, the basic bread with homemade beans and cheese is about 25¢ per serving). 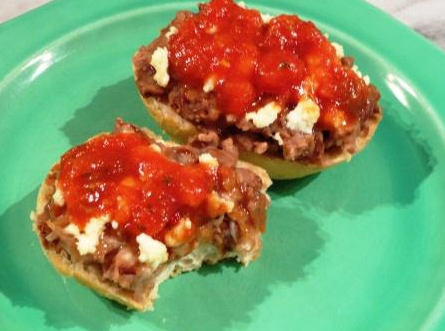 Not only that, although molletes are extremely popular in Mexico, they don’t seem to be well-known in the U.S. outside of the regions with a strong Latino influence. Any time I have served molletes to friends, there has always been someone present who has never heard of them before. People always like to discover new authentic ethnic food, especially when it is so delicious and easy to make. Molletes are a good reason to have a party, so set out a variety of toppings and let your guests make their own. Anything you might put on a tostada is good: sautéed onions and bell peppers, diced raw onions or sliced green onions, pickled jalapeños, sliced avocados or tomatoes, sliced olives, fresh pico de gallo or other salsas, cilantro leaves, sour cream, etc. are all great choices for toppings. Just use your imagination, offer the meal up with a full heart, and ¡buen provecho! One day in early October, signs popped up all over the university campus: Dile ¡no! al Halloween. It was the equivalent of a “Just say no” campaign against a day devoted to pagan witches and ghosts, and there would be no trick or treating at UAG, the Catholic university I attended in Guadalajara, Mexico. However, Día de los Muertos, or Day of the Dead, was a highlight of the semester. Although my heritage is Mexican-American and we kept a lot of the food traditions from the Mexican side of the family, my dad wasn’t really a practicing Catholic, and Día de los Muertos was never an occasion we celebrated while I was growing up. That long-ago autumn in Mexico, though, I loved taking part in the celebrations, which were a combination of wacky fun (macabre costume parades and coffin races across the campus), solemn food and drink offerings and cemeteries decorated with marigolds to honor departed loved ones, and all kinds of seasonal treats like amaranth and sugar skulls and the traditional pan de muertos, or bread of the dead. I taught high school Spanish for a number of years, and making pan de muertos was one of the ways my students learned more about Día de los Muertos. Pan de muertos is a good fine-textured and somewhat dense egg bread, often flavored with a little nutmeg or anise seed. 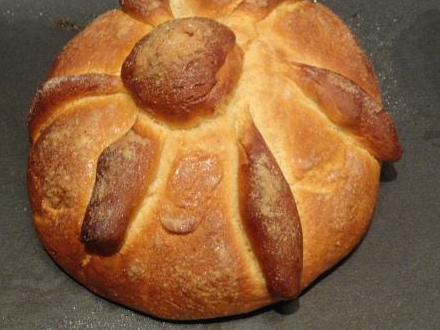 When I used to make pan de muertos with students in class, it was done in stages with the dough rising in the refrigerator to accommodate the schedule (although students always tried to convince me they could skip algebra or biology to hang out and watch the dough rise). 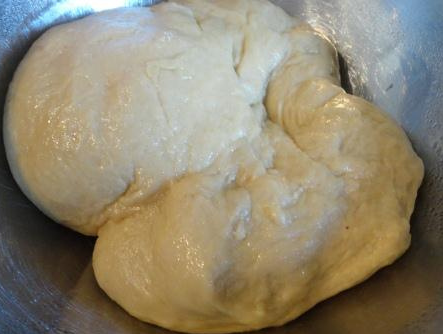 The dough does need a good long rising period, so if you have errands that will take a couple of hours, mix the dough first and it will be ready to shape when you get back to it. 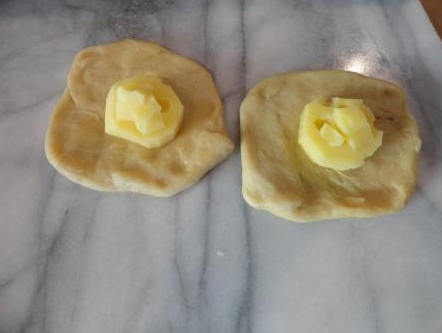 Update October 29: I forgot the butter when I sent this recipe to Kara to post, but I’ve added it to the recipe. 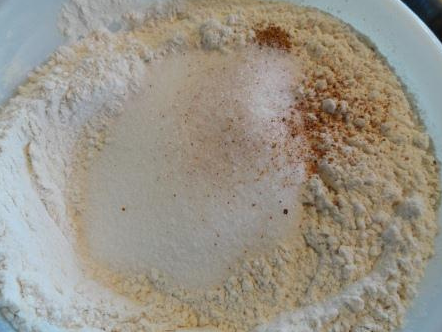 In a mixing bowl, dissolve yeast in the water. 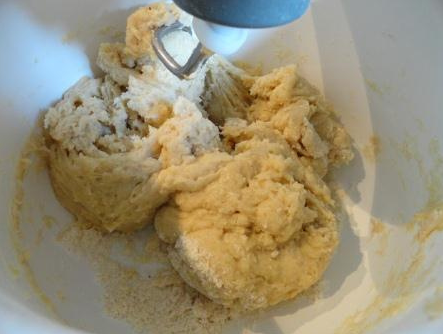 Stir in the sugar and ¼ cup flour and let it sit in a warm place until the mixture is risen and bubbly (20-30 minutes – by the way, this type of yeast-flour-water mixture is called a sponge). Mix the 3 cups flour, salt, nutmeg, and sugar. Break one of the eggs into a cup and keep about a teaspoonful of the whites to use as a wash on the dough before baking. 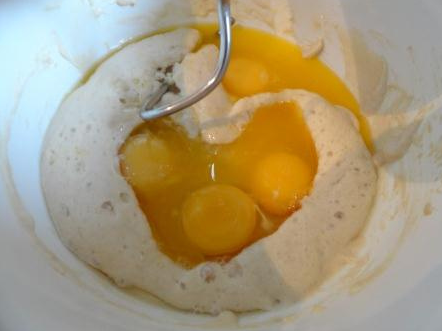 Blend the rest of that egg and the other three eggs into the sponge and then add the melted butter and the flour mixture (much easier if you have a sturdy stand mixer with a dough hook). Knead the dough with the hook or by hand until the dough is very smooth and elastic, adding some of the extra flour if needed. It is a heavy dough, so give it time and plenty of machine power or muscle, at least 15 minutes. 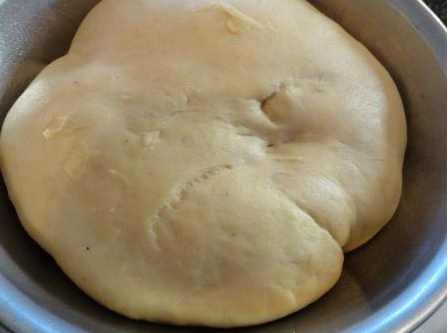 Place the well-kneaded dough in an oiled bowl, then turn the dough over so the exposed surface of the dough is oiled. Let it rise in a warm place until doubled in size, about 2½ – 3 hours (I put mine in the oven, heated to about 100 F. and then turn the heat off). 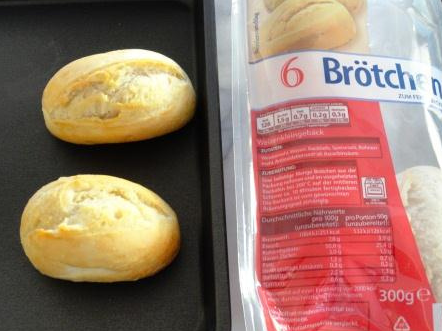 Punch the dough down and divide it in half. For each pan de muertos, pinch off a small handful of dough and shape it into a ball. Take another piece and roll it out into a rope about 12-14 inches long and cut into 4-6 pieces (these shapes represent a skull and bones). 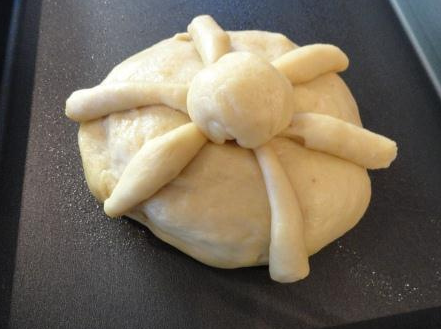 Shape each large lump of dough into a round loaf; place the skull dough ball in the center with the bones radiating out from the skull. Whisk the reserved egg white with a few drops of water or milk until frothy, then brush it over the shaped loaves. Sprinkle generously with sugar and let it rise for another hour, then bake at 375 F. until it is golden brown (once again, I forgot to look at the clock – you’ll know it is done when it smells fabulous and looks like the picture). I only wanted one pan de muertos, so I made some little cheese buns with half of the dough. They are great, and I’ll definitely be making them again. I used chunks of emmentaler, about ½ inch thick and 2 inches across. Shape the buns by flattening the dough into circles about 4 inches across and place whatever kind of cheese you like in the center. 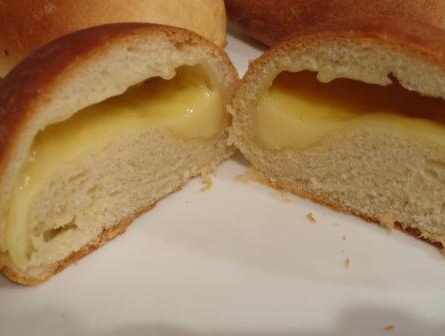 Pull the dough up around the cheese and press to seal the dough; place seam side down on the baking sheet, brush with melted butter, and let rise and bake at 375 F. I had the cheese buns on the same baking sheet as the pan de muertos, but they got done sooner. I mostly skipped the history/culture lesson this time. My former students would be shocked to read this because I always made them do real research rather than citing anonymous open source authors, but the Wikipedia article on Day of the Dead is quite informative and has some great photos. One more update: a friend sent me this great New Yorker article on the Day of the Dead theme. Even though we are past the day now, it’s pretty darn funny (especially for teachers). ¡Ándale, ahorita! ¡Make pan de muertos!